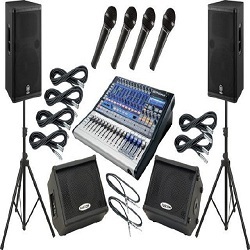 Encore's medium sound system includes (2) Behringer Powered (DSR115) 15" 1500 watt speakers, (2) Speaker stands, (2) 25' Speaker cables, (1) Behringer 5 channel un-powered mixing board (1) 25' mic cable, (1) shure SM58 microphone in black bag (1) adjustable mic stand, and (3) power cables for mixer and speakers. Additional equipment and accessories are available for rental in needed. Delivery is additional but includes set-up of this system by a trained Encore audio technician. This is the perfect sound system for medium size speaking engagements from 1600 sq ft to 5000 sq ft. It is connectable to an ipod or other audio device to play music. * Please call us for any questions on our sound system large rentals in Shreveport and Bossier City, Louisiana.